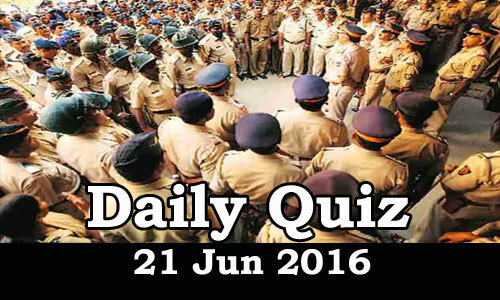 Daily Current Affairs Quiz 21st Jun 2016, Current affairs and GK questions on National and International are listed in the Quiz. Candidates those who are preparing for Government Jobs and IBPS/SBI/RRB exams and all other exams can use these questions. 1. Who released postage stamps on Surya Namaskara to mark the second International Yoga Day to be celebrated on June 21? 2. Nearly _____ pregnant women set a new world record by performing yoga in Rajkot, Gujarat, on the occasion of International Yoga Day. 3. Who launched the fund titled MukhMantri Punjab Hepatitis C Relief Fund to provide free treatment for patients affected by Hepatitis C.
4. Which state has launched an online portal to facilitate loans to financially weak students who wish to pursue higher studies in the city after class 12? 5. Which state government signed an MoU with Chinese heavy machinery manufacturing firm Sany Group for working on investment proposals worth $1 billion? 6. India and _____ signed two agreements that are aimed at enhancing cooperation in culture as well as educational sectors. 8. Tata Advanced Systems Limited (TASL) and Boeing celebrated the foundation laying of a new facility for its joint venture named Tata Boeing Aerospace (TBAL. The venture is going to come up in which city? 10. Kazuyoshi Miura is a famous sports person. He belongs to which sport?